The Mill Valley Jaguars and the St. Thomas Aquinas Saints will face off for a spot in the state championship for the second consecutive season. Last year, Mill Valley topped Aquinas 45-28 and went on to capture the Class 5A title with a 35-14 win over Bishop Carroll. The Saints already got their revenge with a 40-33 victory over the Jaguars in the fifth week of the regular season. Now, Aquinas will try to get back to the 5A championship game for the first time since falling to Bishop Carroll in 2014. Mill Valley is on a four-game winning streak since dropping four consecutive games in the regular season. Last week, the Jaguars captured a 28-14 win over St. James Academy. Sophomore running back Cameron Young led Mill Valley with 151 yards and two rushing touchdowns on 27 carries. Young leads a potent rushing attack for the Jaguars with 1,402 rushing yards and 13 touchdowns. Mill Valley junior quarterback Brody Flaming is a dual threat with 2,465 passing yards and 1,402 rushing yards. Senior Ben Hartman is the top receiving target with 58 catches for 906 yards and 12 touchdowns. Senior Joel Donn is the leader of the defense with 152 tackles, one interception and two forced fumbles. Aquinas faltered toward the end of the season with some injuries. The Saints dropped their final two regular-season games before cruising to three consecutive playoff wins over Leavenworth, Bonner Springs and Topeka Seaman as the team’s health has improved. Last week, the Saints earned a 57-21 win over Seaman. Aquinas gained more than 600 yards of total offense in the victory. Quarterback Will Swanson passed for 202 yards and running back Drew Hicks ran for 131. Aquinas will try to beat Mill Valley for the second time this season just like the Jaguars did to the Saints last year. The lone two 5A teams with double-digit wins match up in a battle of the two of the classification’s top three offenses. Goddard is second in scoring offense at 40.7 points and first in defense with 14.5 points permitted. Great Bend is third in offense at 40.4 points but has permitted 20.2 a game. The Lions have made at least the semifinals for the second time since ’88, first since ’07. Great Bend is in the semifinals for the fourth occasion, first since a runner-up showing since ’06. Both teams had lost in the first round of the playoffs last year. This is the first 5A west semifinal since ’05 that doesn’t feature at least Bishop Carroll, Salina South or Hutchinson. Each team has enjoyed at least a three-win improvement from last year. Goddard earned wins against Bishop Carroll and Wichita Heights in the last two weeks. The Lions limited Heights’ standout running game to 17 plays for 38 yards in the second half en route to a 28-14 victory. The previous week, Goddard defeated the Golden Eagles, 20-12, and forced six interceptions, including a pick-six for the first score. Goddard held the Falcons without a first down in the second half. Heights had averaged 44 points entering the contest. Goddard took the lead for the first time with 8:56 left. Blake Sullivan had 24 carries for 211 yards and three rushing scores of 61, 30 and 29 yards. Kody Gonzalez finished with 17 carries for 74 yards and a pair of scores. Overall, Sullivan has thrown for 1,438 yards with 24 scores against five interceptions. He has rushed for 1,155 yards and 14 TDs. Gonzalez has 1,533 yards and 15 scores and has cleared 100 yards in all but two contests. Goddard has averaged 280 rushing yards and 7.2 yards per carry. The Lions have averaged 7.5 yards per play. In the last two games, Goddard’s defense has permitted Carroll and Heights to an average of 5.6 yards per play and outgained them by an average of 16.5 yards a contest. The difference has come in turnover creation, especially in pass defense. Goddard’s defense has now forced 30 turnovers and is plus-17 in turnover margin. The improvement is keyed by several players, including junior Ian Mcswain, who has a team-high seven interceptions (all since Week 3, including one last week) after he had none in his first 18 career games. Great Bend, known for its offense throughout the regular season, has earned hard-fought wins against Andover (16-7) and Valley Center (28-24) in the postseason. The Panthers are more pass-oriented than Goddard with 199 passing and 231 rushing yards a contest. 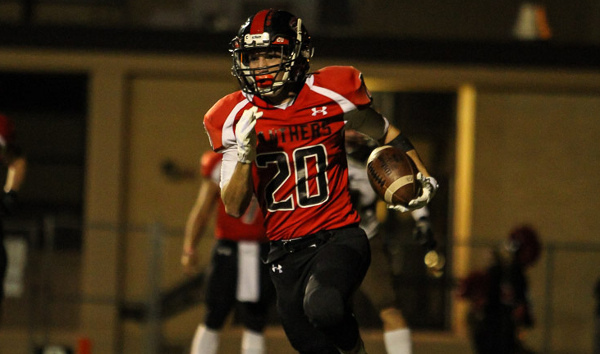 Great Bend averages 6.1 rushing yards a contest and 7.4 yards per play. Senior quarterback Jacob Murray has completed 69 percent of his passes for 2,071 yards with 21 scores against five interceptions. He has 218 carries for 1,268 yards and 25 TDs. Senior Cal Marshall has 143 carries for 1,055 yards and 13 scores. Senior Bryce Lytle has 72 catches for 1,001 yards and 11 TDs. Great Bend has forced just 23 turnovers and is plus-16 in turnover margin. Last week, the Panthers rallied with two fourth quarter scores to beat Valley Center, a team Goddard rolled 49-7 in Week 7. Great Bend, which has been banged up in recent weeks, lost the yardage battle 378-355 to the Hornets. Marshall has been limited to just 15 carries for 43 yards in the last two games. Both offenses are potent, but Goddard’s running game is rolling, while Great Bend has had some trouble in run defense the last several games. A key matchup will be Lytle against the Lions’ pass defense. Great Bend is at home, but Goddard is playing at a very high level.